The “No Zombie Texting” educational video contest is a program to create a youth oriented safety video on the dangers of texting and driving. Wednesday night, after the Ride/Walk of Silence, in remembrance of cyclists and pedestrians who have been injured or killed sharing the road, the Governors Bicycle and Pedestrian Advisory Board and Muscle Powered hosted the awards ceremony where the top three public service announcements were announced. In the Brewery Arts Center’s Black Box Theater, a substantial assembly of spectators gathered to view the video awards. This video, called The Power to Choose, is nearly a year old now, but it still is inspirational. Not because it should be anything unusual, but because it is unusual. The comments are interesting too, some who get it, and some who miss the whole point. The students have found a path to freedom. A fascinating and provocative video from an organization in England, FitRoads, about an experiment which turned off the lights, the traffic signals, and what kind of behaviour followed. I just received this link today, but it seems quite timely following the NDOT meeting on safety improvements to Hwy 50 through Mound House last night, in which much of the audience was advocating for traffic signals at the best solution. 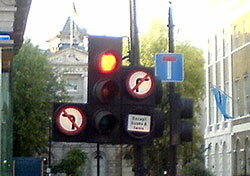 Traffic signals do indeed increase the rate of crashes, though they may decrease the severity of crashes. Could it be that a complete street is a street without signals?Worth thinking about! Here’s a good look at what happens when you reclaim the urban environment from heavy motorized use! She’s back! The woman you love to hate (and hate not to love) Veronica Moss, a Washington, D.C. lobbyist for – ahem! – the Automobile User Trade Organization (A.U.T.O.) In this “chapter”, she’s getting her first gander ever at the new pedestrian-friendly Times Square and she invited Streetfilms along to record her virgin journey.